If you live in an urban area – and, let's face it, most suburbs – your garden is probably on the small size. Perhaps it's no bigger than a tiny courtyard, or is slightly larger but is long and narrow, or is, in fact, a balcony. No matter how small your back yard, our inspiring gallery of small garden ideas can help you transform it into a space that you will enjoy and that looks good. From small garden landscaping ideas to decking ideas, we have something that will appeal to everyone. Once you are set on a design idea that works for you, find out how to plan, design and cost your garden transformation. Small gardens do well with bright colours. Think of your garden a bit like a canvas: if it's large, then colourful accents are more likely to be lost in all that space. With a small garden, on the other hand, you can really make the most of colour, be it manmade or natural in the form of planting. Think bright furniture and pendant lamps. This colourful garden has been kitted out with furniture that has been painted in Annie Sloan's signature Chalk Paint in English Yellow. Feel up for painting your garden set yourself? Find out how to paint furniture in our guide. And find out how to create a garden colour scheme in our dedicated feature. Any garden furniture in a small garden will need to multi-task. So, if you like the comfort of a padded garden bench, make sure the seat comes with a lift up lid with hidden storage beneath. This is all the more important with permanent furniture that can't be moved. This DIY outdoor storage bench has been painted in Brassica by Farrow & Ball to soften the look. For a similar bench, try B&Q. Small garden design ideas can be quite subtle. Take this one, using zoning, a trick usually reserved for breaking up large indoor rooms into different areas – say, one for relaxing, and one for dining. The key to garden zoning is using different textures, colours or materials to differentiate between the areas. Flooring, for example, is perfect for doing this, and will create a larger-feeling, more interesting space. This clever small garden design by Anna Carin Design combines decking and patio paving to achieve the zoned effect. Find out how to choose the best patio paving for your garden and browse more decking ideas for small gardens. Even if your outdoor space is really tiny, you can still enjoy a proper afternoon tea or al fresco lunch – you just need a garden table that can be folded away when you're done. For other table options, check out our buyer's guide to the best small garden tables. This outdoor space with a folding table has been painted by Farrow & Ball. For a folding garden table, try Garden Furniture Land. Container gardening is the perfect planting solution for many small gardens, especially if yours has a patio or decking. The trick is to go for as many different types and heights of garden as possible: this will help add dimension and texture to the space. For instance, mix and match large terracotta pots with tall and slender glazed pots. And if you have a really small space, stack them up like this or wall-hang them to pack more in. Learn more about container gardening for small spaces. A boho garden style works very well if you're looking for creative small garden design ideas. Busy and eclectic can be a very good thing in a smaller space, partly because you are drawing attention away from the smallness of the garden and towards all the different textures and colours of your soft furnishings. Go to town on cushions, throws, and rugs to create a really cosy space perfect for lounging late into the evening. The soft furnishings used in this garden are from the Global Gathering collection by Talking Tables. Check out more outdoor living space design ideas and boho design ideas. Barbecue parties are not just for huge gardens – in fact, there are plenty compact and portable BBQ designs suitable for even the smallest space. The Rockwell 220 charcoal barbecue from B&Q is one of our favourites, providing space for food preparation and storage. Check out more options in our buyer's guide to the best portable BBQs. If your outdoor space is really very small, an outbuilding, no matter how slimline, is likely to overwhelm it. So, think about garden storage a bit more creatively: ideally, you want items that will be useful and attractive, and provide extra room for container plants. If you do fancy a shed, choose a slimline one. We have the best small garden sheds in our buyer's guide. The Latchmere range from Garden Trading has it all: the storage space, the good looks, and built-in planters. What small balconies and terraces lack in floor space, they can make up for with a sense of airiness and height. Emphasise these positives with an attractive pendant light or a hanging canopy. This beautiful draped balcony has been kitted out with a chair and table from the Cabana 4-Seater Garden Lounging Set from John Lewis & Partners. We have lots more ideas for small garden terraces and balconies. Bistro sets are the failsafe choice for small gardens – slimline and easy to incorporate into virtually any garden design scheme. Our tip is to pick a foldable garden bistro set. This small garden sports the lovely Rive Droite Bistro Set in Dorset Blue from Garden Trading. Want a small garden idea to liven up a tiny decked area? Our top tip: don't buy a full dining set, simply take your comfy indoor dining chairs out when it's time to dine out. Think upholstered and padded, like the delicious Monty Velvet Chair from Graham & Green. Take a look at our pick of the best contemporary dining chairs for more options. Okay, so maybe taking your dining chairs inside and out is a hassle? Choose stackable chairs that can be put to one side when not in use. Not all stackable chairs were created equal: don't compromise on quality when picking yours. The Lola garden chair by Danetti is made from a high-quality, easy-clean plastic and comes with floor protectors. Check out our buyer's guide to the best outdoor chairs for your garden. Outdoor fireplaces are actually even better suited to smaller gardens than larger ones, for the simple reason you will really feel the cosiness in a smaller space. If your house won't permit the addition of a fireplace structurally, consider getting a chimenea or fire pit instead. We have the best chimeneas to heat up your outdoor space. The easiest way to create shade and protect your dining area from rain? A large garden umbrella. Simply remove when you want to enjoy the sun (if it's out, that is). Consult our buyer's guide to the best patio umbrellas to choose yours. Gravel is a great material for creating fluid, easy-going paths that are flattering in gardens big and small. To create an illusion of space as part of your small garden landscaping, build a central path surrounded by luscious borders. Find out how to lay a gravel path and how to choose the best gravel for your garden. This small garden design is by Rory Andrews Landscape Design. Think trees are only for large gardens? Not necessarily. Plenty of species will do fine in a small garden, or even in a garden container. The benefit of having a tree in your small garden is you are visually expanding your garden upwards, rather than keeping all the attention on the limited floor space. This garden benefits from a stunning plum tree. Find out what the best trees for small gardens are in our guide. Layering is actually very simple, and has been used in garden design for centuries. Just think taller plants in the background, herbaceous perennials and grasses in the middle, and annual flowers at the foreground. Try layering colour, too – you may wish to have gradations of just one colour, or classic colour combinations such as red and purple. Find out how to create beautiful garden borders with our guide. Even the tiniest garden can become a luxurious, relaxing sanctuary. You will have to decide what's most important to you – a fully planted up outdoor space, or a swimming pool/garden water feature, however small? Once you've decided what you want your garden to be, there's no reason you can't achieve it, with the help of a skilful garden designer or landscape architect. Learn more about adding a swimming pool and browse our beautiful gallery of luxury garden design ideas. 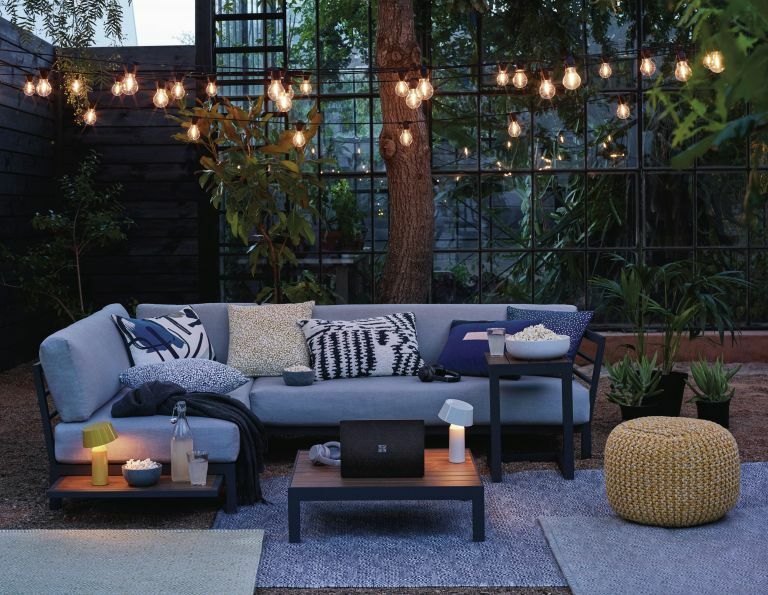 Clever lighting is the perfect small garden idea for visually enhancing your space. To make your garden look bigger, you may choose upward-facing spotlighting or accenting a tree with fairy lights. This garden benefits from Festoon Outdoor Line Lights from John Lewis & Partners visually enhancing its height. Get more advice on how to plan your garden lighting in our guide. Then browse more tips for making a small garden feel bigger. Another trick that emphasises the height rather than width of your garden is planting a green wall. Choose fast-growing climber species such as jasmine, honeysuckle, and ivy. Find out more about creating a vertical garden or living wall in our guide. There's no hard and fast rule on where to position your garden furniture in a small outdoor space, but generally speaking, it makes sense not to place any heavy, non-portable pieces centrally, because everyone will inevitably keep bumping into them. Instead, opt for a corner sofa and a compact coffee table. The Amelia corner sofa is from Dobbies. Can also be purchased as part of a set with the fire pit. This indoor-outdoor space by Granit Architects uses continuous flooring to relax the boundaries between home and garden. You can maximise this with accessible glazing, and replicating the same decorating scheme inside and out. Find out how to successfully link your indoor and outdoor spaces. Even the smallest courtyard can be made to look chic and inviting with clever use of materials, levels, and lighting. This Chelsea courtyard has been given a sleek makeover with multiple layers of light limestone paving. By Charlotte Rowe Design. Just as you'd paint walls in a light colour in a small room to make it feel bigger, doing so in a small garden will make it feel larger. Another small garden idea? Think 'up' and 'out' by mounting your container plants onto a garden wall or fence. The effect will be especially stunning if you choose trailing plants (trailing pelargoniums are especially appealing). Learn more about choosing plants for your garden. Talking of small garden ideas that make your outdoor space feel bigger and brighter, get that charming cottage garden look – and make your small garden appear larger and lighter in the process – by liming your exterior and your garden furniture. This traditional preservation technique is coming back into favour in modern homes too for a chilled Scandi look if cottagey is not your vibe. Find out how to lime wood in our practical guide to go the whole hog with your garden furniture, too. Small garden design ideas that include a tiny lawn? Here's a great one. But don't neglect it; a neat and sculpted lawn, however small, will give your garden a smart and spacious look; like a large formal garden, but in miniature. To keep your lawn in top shape, mow it regularly. We have the best small lawnmowers in our buyer's guide. And for practical tips and techniques, consult our guide on how to mow a lawn. Or, you can choose a fake lawn like the one below. Find more alternatives to laying a lawn in our guide.